Just so you know, I rabun actually. Both my eyes power are 250 and I think it's quite high. I first discovered that I'm short sighted was during my study days, you can read it here (kisah si mata). But I really really hate wearing glasses. I think a first timer can relate to this, our tudung wouldn't 'jadi' when we wear glasses, well I think I look hideous with spectacles on. That's why I love wearing contact lenses. But it just recently that I fell in love in colourful lenses. And I want to brag to you about my latest collections. I bought these two pairs online at qaylaa_lens Instagram. It was during promotion that they cost only RM40 for two pairs include postage, so cheap! The brown colour code : Winnie Brown. It has no rings and I love lenses with no rings! 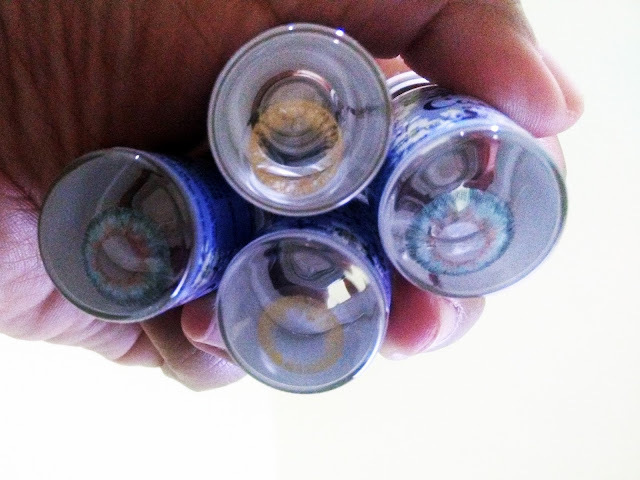 Qaylaa_lenses was super efficient, it's my first time dealing with them actually and without a doubt I'll repeat order next time. As for the lenses, they're super comfy and easy to apply on. Here's a look at the blue one I wore earlier today. Aren't they beautiful? Yeah I mean the lenses, not my eyes. Teehee. So for contact lenses lovers out there, I would recommend you to buy these lenses, they're gorgeous. its been a long time i am a contact lense user, now i am using glasses hee. but i do wear lenses when i have a special event. but how does the lenses feel when you wore them? is it comfortable and easy to wear? Suka tengok orang pakai lens tapi tak berani pakai .. ._.